Odd thoughts about flying, aerobatics, software engineering and other things that cross my mind. Japan has by far the best public transport system in the world. Major cities are linked by 200 mph trains, every large town has a frequent rail service, and even the tiniest town has several buses a day to the nearest station. Every city has a dense and frequent bus service, while in Tokyo you're never more than a five minute walk from the train or subway. Japanese trains are a delight to ride, with constantly changing views of the towns and countryside. With the exception of the Tokaido Shinkansen between Tokyo and Osaka, they are rarely anywhere near full. So given all that, why would you ever want to drive? The traffic in towns is difficult, parking is expensive and hard to find, while navigation, if you don't read at least some Japanese, is bound to be hard. But... if you want to see the countryside, to stop at leisure to admire the view, to wander at will - you need a car as much in Japan as you do anywhere else. It's possible to view rural Japan from a bus, I've done it a couple of times. It works, but it is very constraining. When we visited Wakkanai in the far north of Hokkaido, we couldn't rent a car (I'd forgotten my international driving license, which is essential). We did manage to get to Cape Soya, Japan's northernmost point, using the bus, but we had a very tight timetable and didn't have time to see all the various monuments that have been established there. Car ownership is relatively uncommon in Japan. You can't legally own a car unless you have off-road parking for it. That's why there are so many really tiny cars - often you will see them squeezed into a garage so small that you wonder how the driver gets in and out. As a consequence, car rental is ubiquitous. Close to the main station in every town, you'll find Toyota Rent-a-Car, Nissan, Nippon, Times, and a couple of others. It's taken for granted that people will use the train for the long journey, and a car only for the very final part. But you didn't see any of the familiar names there: Avis, Hertz, Enterprise... You can make reservations through them, but they will be fulfilled by Japanese companies with different names. For example, I recently used Expedia, which made me a reservation through Europcar - but I actually had to go to Times Car Rental, and nothing in the reservation told me that, nor gave me their correct address. It's better to book directly with a Japanese company. If you have a few days in Japan before you need the car, your hotel concierge desk will generally be able to do this. Some companies have english-language sites (e.g. http://www.timescar-rental.com), and there is a site called ToCoo! you can use. The Japanese drive small cars. This is a good idea, because the roads are narrow, city streets sometimes frighteningly so, and parking spaces are small too. 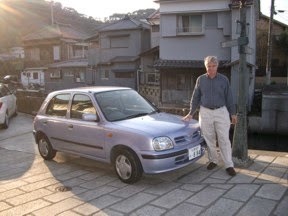 A "mid-size" car in Japan would be one of the smallest cars on the road in the US. Don't try to get a normal-sized car by US standards, it will cost a fortune and you won't be able to park it. You can not rely on your own driving license. Japan is a country which absolutely requires an International Drivers Permit (IDP). If you don't have one, when you show up they will apologise a lot but they won't give you a car. In most countries these are available through motorist organisations such as AAA (US) and RAC (UK). For some countries, including France, the procedure is different, and you need an official translation of your license instead. The pick-up procedure is generally painless. You find the office (usually the hardest part), you present your passport and IDP, and they show you to a car. Make a careful note of where you are, because you will have to find it again when you return the car. Drop-off is also painless, apart from finding the place, and assuming you haven't damaged the car. Most places have little experience renting to foreigners, and they are very relieved to see you back again. I once dropped off a car a few minutes before closing in a small town, and the staff were standing at the roadside waiting for me! If possible, get a map from somewhere (for example, your hotel concierge) showing the exact location of the rental office. Otherwise, you may well spend a miserable half hour wandering up and down the vicinity of the station looking for it. Also, be careful which side of the station it is. Most stations have entrances on either side of the tracks. Often rental places are on the "wrong side of the tracks", away from the main entrance. Driving in Japan is easy. Speed limits are low - 50 km/h (30 mph) on most roads, only 80 km/h on highways. People sort-of obey them, as elsewhere - most traffic is doing closer to 60 than 50, but not more. Important signs are easy to understand. There are lots of signs that are only in Japanese, but they're not giving directions. They say things like "sharp curve 200m ahead" - useful but not indispensible. Roads in Japan can be strange. It's the only country where two-lane divided highways are common. That's right, just one lane in each direction, with no possibility of overtaking. It matters less than you'd think, because the speed limits are so low and everyone is driving at the limit anyway. The road around the western coast of Shikoku is sometimes barely two lanes wide, then for a few km it's a four-lane highway. It alternates like this for a long way. The giant refrigerated trucks carrying fish to market don't care, they just barrel along at 60 km/h whatever the state of the road. In Hokkaido, we were following a road along the coast that got narrower and narrower, and eventually turned into a dirt track. We were just thinking about turning round, when in the middle of nowhere it turned into a four-lane highway - better than the main coast road running inland. There was no apparent reason, no factory or houses. I'm sure there's a story behind it. The hardest part of your journey is likely to be getting out of, and later back into, the town where you rent the car. Signposting in towns is almost non-existent and roads are often not quite as they seem on the map. You should really prepare carefully for this. Print bilingual maps from Google, possibly at several different scales. Even if you don't know the exact location of the rental office, it will be somewhere close to the main train station. It goes without saying that you should drive carefully and be sure to stay legal. Even if at home you sometimes interpret the rules a bit flexibly, don't do it in Japan. It's said that if ever there is an accident involving a non-Japanese driver, they will always be at fault. I hope I never find out whether it's true - I really don't want to spend a few nights in a Japanese jail. And nor do you. And of course don't even think about drinking and driving. There's nothing to do and nowhere to go in the evening in rural Japan anyway. You will have to refuel the car at least once, just before you return it, and maybe more if you drive a long way. Fortunately, this is easy. Gas stations ('gasoreen stando') are ubiquitous. In towns they are often hidden in a space under a large building, with only the sign visible from any distance. The most common brand is Eneos, with a distinctive orange sign. Japanese for "fill 'er up" is 'mantan', but gestures work fine too. Most gas stations are fully staffed, you just sit in your car while eager young men run around filling it and cleaning the windshield. Sometimes there are surprises. We once refuelled in the depths of rural Hokkaido, and were rewarded with not just one but half a dozen large boxes of Kleenex. In our tiny car they took up way too much room, but it seemed churlish to throw them away. Now we get to the hard part. Japan has really excellent maps. Mapple publish road atlases, one for each prefecture, at a scale of 30,000:1, with enlargements for towns. There's also a very useful series of folding maps at 120,000:1 (about 2 miles to the inch). These are all available for the whole country at big bookshops. You can often find the local ones even in convenience stores. But... they are only in Japanese. The best bilingual map of Japan is "Japan: a bilingual atlas", at a scale of 260,000:1. That's enough to show all towns and significant roads, and it has enlargements for major towns. Used in conjunction with one of the bigger maps as a sort of translation guide, it will get you there. Google maps is also bilingual. If you have a tablet and a reasonable deal on roaming, you can use that. Even if not, you can use it to prepare your trip and maybe print some of the more critical bits and take them with you. Directional signs on roads are written in English characters as well as Japanese. As everywhere, they won't necessarily tell you about the place you want to go to, so you need to have an idea of the route and other places that might be in the right direction. Every rental car has GPS, but not only are the maps all in Japanese, so are all the controls. I do read Japanese, but I've still never managed to get anything very useful out of them. On one occasion the GPS had been programmed to go back home. At every junction and turning, a cute Japanese girl voice would plead with me to make a U-turn. It took me about an hour to find the right place to press to shut it up. The GPS can be useful in towns. While I really strongly recommend against driving in towns, at some point you'll have to get to and from the rental location. Even though you can't read the map, you can get a general orientation get yourself headed in approximately the right direction. These days, they show gas stations too, which can be handy (look for the tiny Eneos logo). If you really want to explore the Japanese countryside, a rental car is the only way to do it. It's a bit daunting, but not too hard. Well, not really the South, but at least not the North. And certainly sunny. Isabelle had another meeting in Sapporo. Wakkanai was interesting but Hokkaido's charms in December have their limits. 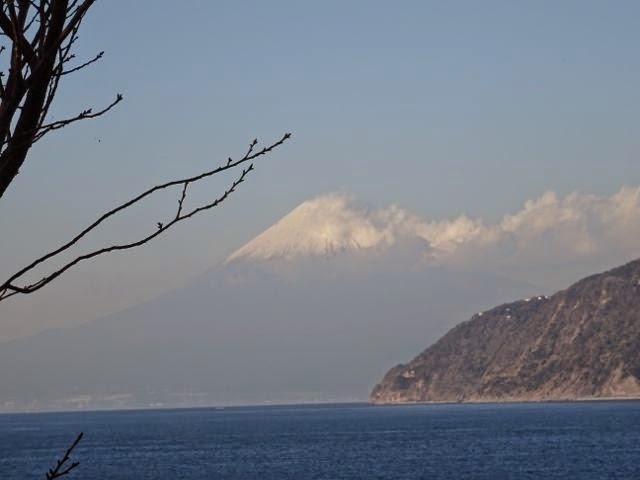 So we decided to spend a couple of days on the Izu Peninsula, just south of Tokyo. 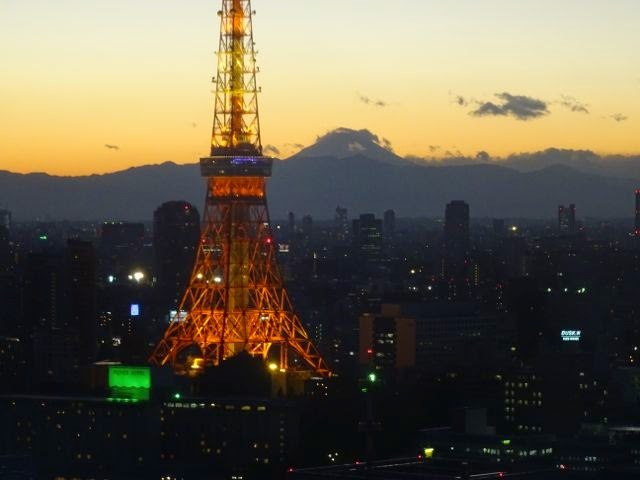 In Japan, it's a famous tourist destination - with justification, since it is beautiful. We drove round it in one day, a few years ago, but this time we would take our time, spending a couple of nights in traditional Japanese ryokans. Every trip to Japan starts with Tokyo. 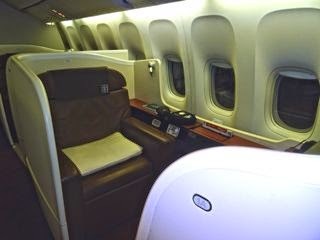 Using BA miles, the only seat I could get was in Japan Airlines First Class. Poor me. It was very nice. The champagne they served was Salon 2002. I'd heard of it only because, believe it or not, Isabelle sat next to Mr Salon (not his real name of course) on a flight to Paris a few months ago! It sells for about $300. Its main claim to fame seems to be exclusivity - any footballer can buy Dom Perignon or Krug, but you have to know about this stuff. I can report, though, that it is indeed excellent, very complex without the biscuity heaviness of Krug. The rest of the flight was excellent, too. I slept through most of it, thanks to the comfort of the wide, lay-flat seat. The service is everything you'd expect. And there was a quite unexpected bonus. Our flight was nearly an hour early. It's scheduled to be one of the first flights into Haneda (oh, that's another nice thing - it doesn't go to Narita, the world's most inconvenient airport), leaving San Francisco just after midnight and arriving just after 5 am. So we were the first flight into Haneda that day, and since I was in seat 1A, I was the first person off the plane. I was the very first passenger to set foot in Haneda that day! Considering that nearly 200,000 people use it every day (it's the 4th busiest airport in the world), I found that pretty amazing. Arriving early wasn't without problems, though. Connections from Haneda into Tokyo are excellent. The monorail service finishes within a short walk of our hotel. But it was nearly an hour before the first train. I decided to take a taxi. Nearly everything in Japan works perfectly. The trains are on time to within seconds, everywhere is safe and clean, the people are friendly and helpful. Taxi drivers, though, don't work quite so well. This one had never heard of my hotel, although it is quite big and has been open for decades (I know, because I stayed there on my first trip to Japan in 1982). He called for directions, but when we stopped it was in completely the wrong place. Eventually, after some discussion and another call, we made it. This was only the first of the trip's taxi adventures. We'd decided to stay at the Shiba Park Hotel. 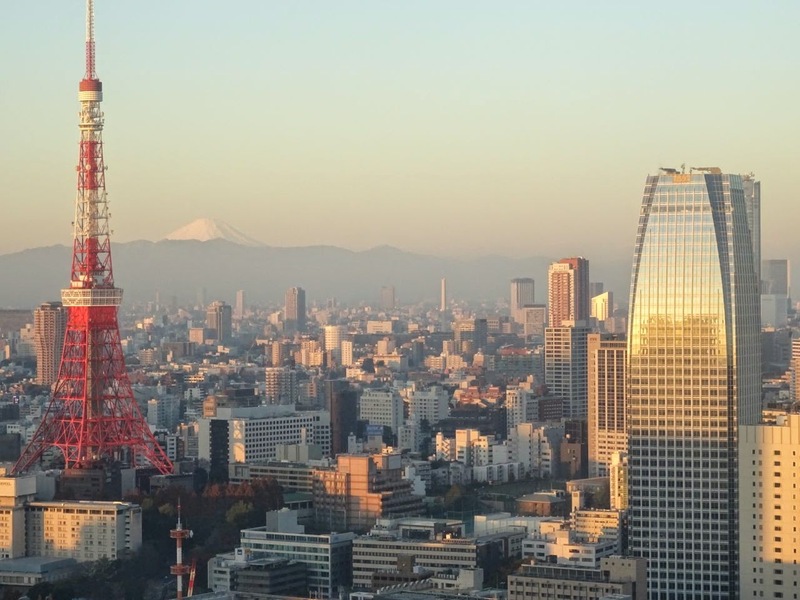 It's convenient, but it was really a touch of nostalgia - when we used to travel to Japan together in the 1980s for meetings at the Japanese Institute of Standards, just opposite the Tokyo Tower, we stayed there. It is full of memories - the open area on the second floor where we stayed up drinking vending-machine beer until very late, that we called "Lois's Bar" after one of our colleagues; the long disappeared fast-food restaurant on the corner called "Rubbery Pancakes" (well, it could have been "Lovely", it's difficult to be sure in katakana). Nostalgia, though, isn't what it used to be. 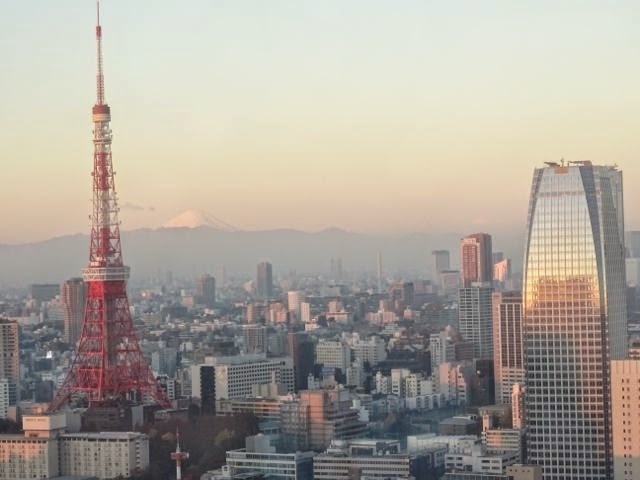 We found it all rather old and cramped, with a view over the roof of the building across the road, and decided to move to a much more modern place a few hundred yards away, with magnificent views over the Shiba Park, the Tokyo Tower, and Zozoji. We spent the morning exploring the area. Zozoji is an enormous temple. 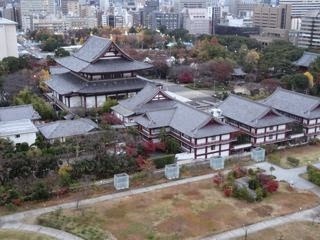 It was once the personal temple of the Tokugawa family, who ruled much of Japan for a couple of centuries. It's still evidently an important place - in addition to the vast main temple and several smaller ones, there are also administrative office buildings. We also found a wonderful place for breakfast. It's called "Le Pain Quotidien" (Daily Bread) although you'd be broke if you ate there every day. The quality and variety of their bread is really extraordinary. We went on a shopping trip to Ginza, but were diverted by an enormous antiques market. Isabelle bought far too many porcelain dishes for our limited amount of baggage. For lunch we happened upon a tiny noodle shop in a back street. 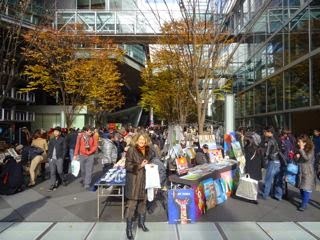 Ginza is the biggest, chic-est, most expensive shopping area in the world, yet it still has room for places like this. It had maybe six little tables, the husband in the back cooking while his wife served. Pride of place in the entrance was their soba-machine, where long before lunchtime they make their own noodles from buckwheat flour. After that we were exhausted, and decided to get a taxi back to the hotel. Even though there are two metro stations within a short walk from the hotel, they are both served by lines that seem to go nowhere useful. The Oedo line in particular, constructed at great expense in the 1990s, seems to have been carefully calculated to avoid anywhere at all that might be a useful destination. We found a taxi quickly and jumped in. The driver set off in the right direction but then ran out of zeal. Eventually he pulled off the road and started consulting atlases. I explained to him (in Japanese) exactly where the hotel is, but despite much head-nodding it clearly didn't help. Finally, in desperation, he passed me his Tokyo street atlas. Good job I can at least somewhat read Japanese. Next morning, after another breakfast at Le Pain Quotidien, we set off for Izu, taking the Shinkansen to Mishima. In the process I accidentally discovered how to save nearly half an hour on the journey by taking a fast train that overtakes the one you have just missed, then changing onto the latter at an intermediate station. Just as well, because at Mishima we ran into a problem I was fully expecting. I'd booked a rental car through Expedia, with Europcar. The problem is, none of the well-known western rental companies has a presence in Japan, and the reservation didn't give the name of the company that would actually rent us a car. And the address that the it did give, didn't correspond to a rental company. I went to the first place I saw. They sent me somewhere else. That wasn't right either. Luckily, all the rental outlets are always within a short walk of the station - how else would you get there? After walking up and down the street in front of Mishima station for a long while, I finally found the right place. After that it was plain sailing, and we headed for the eastern coast of Izu. 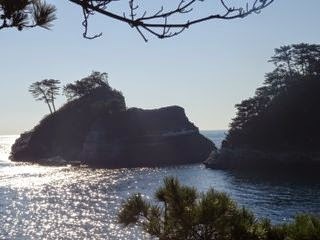 Izu is really an extraordinarily beautiful place. The coast is a ragged series of inlets in black volcanic rock, dotted with tiny pointed islands topped with clumps of trees. Inland is nothing but tree-covered mountains. It rains a lot, and the vegetation is correspondingly lush, while the ocean keeps temperatures nicely balmy. It's impossible to avoid the comparison with Italy's Amalfi Coast. After exploring the coast, we arrived at our first ryokan, the Kanaya in Rendaiji, just north of southern Izu's main town, Shimoda. It's a very traditional, rather rustic place, all unpainted timber construction, famous for its bath, the Sennin-furo - literally, the thousand person bath. It is huge - I did the math and concluded that a thousand would be a tight squeeze, though probably doable if they were good friends. I'd sprained my ankle earlier, in a walk along the coast, and the bath made for some very welcome relief. 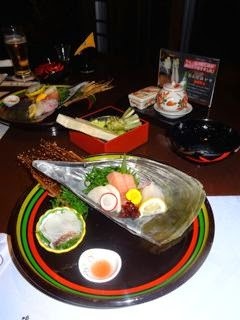 Dinner was the usual delicious kaiseki, served in our room. At 9, we went to bed (or actually futon). There is absolutely nothing else to do in most ryokans. Once, in Ibusuke, Kyushu - a famous seaside town, comparable to say Carmel or Torquay - we decided to go for a walk, look for the local night life. It took some persuasion to get our shoes back. We walked for about twenty minutes, saw absolutely nothing and nobody. When we returned the owner was still standing anxiously in the porch waiting for us. If we'd been much longer, I suspect he'd have called the police and gone through the "lost gaijin tourist" procedure. My ankle problem led to an interesting adventure the next day, first to find the pharmacy and then to buy a walking stick and other bits and pieces. Everyone we asked gave different directions, but the village was so tiny that we found it in the end. The people there were extremely helpful, although the only stick they had was more suited to the bent-double old women you see in every Japanese village - a bit on the short side for me. Shimoda's claim to fame is that it was the landing spot for Commodore Perry in 1853, on his mission to open up Japan to trade with the US. It was an amazingly brave mission - they set out with just seven ships. It's hard to see how they thought they could succeed, but they did. It helped that they had a new design of cannon shell, with which they told the Japanese they would destroy their cities. A taste of things to come, really. When they returned in 1854, Japan had agreed to practically all of their demands. This was the real start of Japan's reopening to the rest of the world. As a result - and odd as it seems - there is a statue and small park dedicated to him on the waterfront. It's a bit as though Calais had a statue of the Duke of Wellington. From there we drove around the southern cape of Izu and up the western coast. There are no trains on this side, and as a direct consequence there are many fewer tourists, even though the coastline is even more spectacular. There are a handful of onsen hotels along the coast, but nothing like a similar area in Europe or the US - the Amalfi coast, in particular. The sea around Dogashima is dotted with tiny story-book pointy islands covered in little tufts of trees. It would have been good to take a boat trip, but we were running short of time. The main town on this coast is Matsuzawa - population 5000, plus presumably quite a of of tourists at least in the season. We planned to stop there and get some lunch - a bowl of soba would be ideal. We looked everywhere in the town centre, to no avail. There was what looked a bit like a small restauarant, but it turned out to be an antique store. We asked the proprietor and his wife where we could get some lunch. If we'd asked them for directions to the Lost Treasure of the Incas, the reaction would scarcely have been different. Eventually after much "soo desu ne" they decided that there probably was one somewhere and have gave us directions in some general direction. But there was nowhere in sight. In fact we did eventually find a couple of tiny places, but by then we were fed up. Luckily there was a convenience store - there is no shortage of those even in the smallest places - so we bought some rice snacks and cookies, and ate them overlooking Dogashima. We had a sudden and completely unexpected view of Fuji-san. Then it was time to head inland to our second ryokan, at Shuzenji. The Kikuya Ryokan is very different from our first night. It has been there a long time but was completely rebuilt a few years ago, so the buildings are modern. It's a truly high class place, with wonderful service. The bath was less spectacular than at Kanaya, but dinner was much more sophisticated. Unusually, it is served in a dining room, with discreet cubicles but (oh thank you!) conventional tables and chairs rather than half-kneeling on tatami. Early to bed again, and to rise in time for a complicated day of travelling. First return the car in Mishima, a quick shinkansen journey to Shinagawa, the Keikyu line to Haneda, and an ANA flight to Sapporo. By the time we got to our hotel there, it was nearly time for the dinner associated with the meeting Isabelle was there for. Time to jump in a taxi. The dinner was at the Sapporo Beer Garden, by far the biggest tourist site in the city. After the station it is probably the single most common destination for a taxi. And - yep, you guessed - our taxi driver couldn't find it. Our journey petered out in a dubious industrial area on the wrong side of the railroad tracks (literally). Then, after some discussion, he suddenly said "Ah, Sapporo Beer Garden, desu ne!" and off we shot to the right place, which was in the opposite direction. To a first approximation, there is only one meal you can get in Sapporo: "Gengis Khan". It consists of thin slices of lamb, grilled at the table along with some chopped vegetables. It owes absolutely nothing to Japanese cuisine, being rather of Mongolian inspiration. Why Sapporo has adopted this as its city dish, I have no idea. It's kind of OK the first time, but after a while you can't help hankering for a nice plate of sashimi. The next day was cold, grey, and alternately rainy and snowy, and gave absolutely no reason to go outdoors. Isabelle had her meeting, and I stayed in the hotel room and worked. Afterwards, back to the airport and another ANA 777 took us back to Haneda, and to our next hotel, in a brand new tower in Shimbashi. 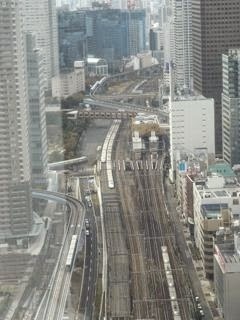 Our room was on the 33rd floor, with magnificent views over Tokyo (including our previous hotel). Best yet, it was right over the railway tracks, with a fantastic view of no less than 12 parallel (or almost) tracks, including the Shinkansen to Osaka (ten high speed trains per direction every hour), the Yamanote line (Tokyo's equivalent of London's Circle Line, with a train every 90 seconds or so) and the monorail line to Haneda. I don't think I ever looked out of the window and saw all of the tracks empty. It was common to see six or seven trains at the same time. 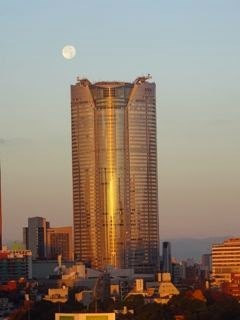 It's a five minute walk from Shimbashi station to the hotel. What's amazing is the number of different ways you can do it. The obvious way, at street level, is by far the least convenient, with long waits for traffic lights to cross the busy streets. There's an underground shopping mall which goes most of the way, and there's a series of elevated walkways. I don't think we found them all. Or if you're feeling lazy, you can take a train - the little Yurikamome line has two stations barely a train-length apart, one at Shimbashi and one beside the hotel. Japan, including Tokyo, is not a place you can "do". 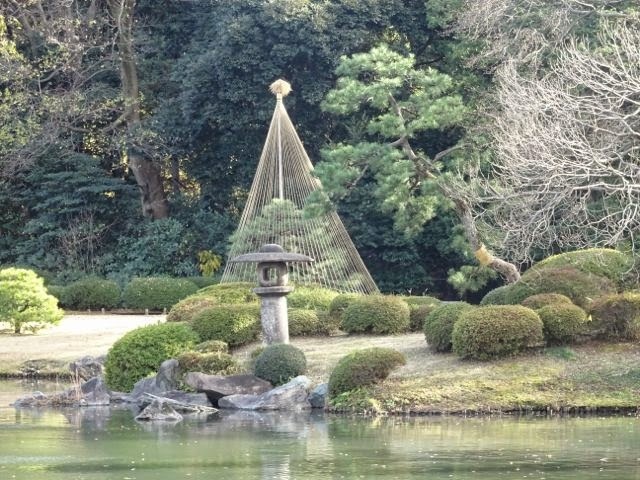 Apart from the magnificent temples of Kyoto, there are no real must-see tourist sights. Rather, it's a place to experience. And that's exactly what we did for the next two days. We had lunch at our favourite rotating sushi place in Shimbashi, we visited Tokyu Hands in Shibuya, the very best craft and hobby store in the whole world, by a long way. On Friday night we had a very enjoyable dinner with some of my old friends from Cisco. 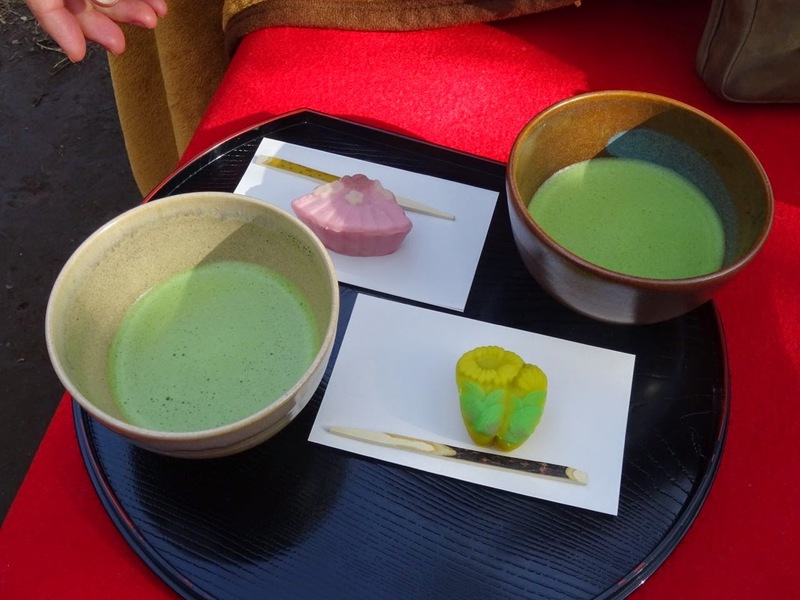 On Saturday we visited one of Tokyo's several samurai-era gardens, the Rikugi-en, and drank traditional tea-ceremony tea with traditional Japanese sweet rice-paste cakes. These days, that's as exotic to the Japanese as it is to us. In Tokyo now there is a western-style patisserie about every ten yards. Some are better than others - some are truly excellent, the best in the world - but one things they all have in common is calories. And sadly, this shows in the people you see around Tokyo. Twenty years ago, overweight Japanese were practically impossible to find. Now, especially women, they are quite commonplace. It isn't Mississippi, yet, but it's certainly heading in the wrong direction. Before that, though, we had another huge surprise. Our old friend Fuji-san was clearly visible on the horizon, over 100 km away. We also went back to Harajuku. A few years ago, this was famous for all the "cosplay" kids - girls (mostly) in all sorts of fancy dress. This time, though, the craze seems to have almost died out - a shame, because it was really colourful. The teenage shopping street, Takeshita Dori, is as crammed with people as ever, but they're all dressed in boringly normal clothes. I couldn't help thinking of Carnaby Street in London. Briefly, in 1968, this was the epicentre of the youth movement, the in place to be seen and to buy the latest fashions. By 1969 it had turned into a tourist trap, selling cheap imitations of 1968 fashion - and still, nearly 50 years later, it is exactly the same thing. Probably every first-time visitor to London goes there, and it absolutely isn't worth it. Our flights home left after midnight, so we still had time for one more dinner. This time it was a reunion with some former colleagues of Isabelle's, another delightful meeting with old friends, in a little place near Shimbashi. And then, back to the hotel, and a short wait for the bus to Haneda. Once on the bus, I realised I'd left my Shimoda walking stick in the hotel - impossible not to see that as somehow symbolic. In 1890, the US Government passed the Sherman Silver Purchase Act. This extraordinarily misguided piece of economics required the government to purchase all available silver at a fixed price, convertible (indirectly) to gold. The immediate and predictable consequence was a boom in silver mining throughout the West, especially in Colorado. The next - equally predictable - consequence was massive over-production of silver and - thanks to the convertibility to gold - depletion of federal gold reserves. The act was repealed in 1893, instantly followed by the collapse of the price of silver and the abandonment of all those mines. By then, though, construction of railroads to serve all these mines was well under way. In the far southwest corner of Colorado, the Rio Grande Southern connected Durango, via a great deal of beautiful but virtually uninhabited countryside, to Ridgeway. After its brief heyday the line never turned a profit, yet somehow it struggled on despite the total absence of the traffic it was built to serve. The distances were huge and roads non-existent, so the small amount of farming and what little mining was left just about paid for the few trains that ran. By the 1920s, road competition was starting to hurt. 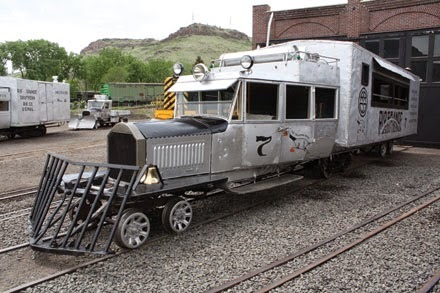 The line superintendent had the brilliant idea of taking some second hand Buick and Pierce Arrow automobiles, and converting them to railcars. They were big enough to carry the tiny passenger load and, more important, handle the mail contract and the parcel traffic in a box-car tacked on to the back of the car chassis. Thus was born the Galloping Goose, and thereafter steam was used only for special occasions, when the traffic justified longer trains. Seven Geese were built altogether, though only five carried passengers and normal freight. They rattled their noisy and smelly way through the deserted Colorado back country for two decades, saving the line from oblivion in the Great Depression of the 1930s. Finally in 1949 the railway lost the mail contract. In desperation, the freight car portion was opened up and converted to panoramic passenger accommodation. But it was no good, and the line finally closed completely in 1952. By then, though, the Rio Grande Southern and its big brother, the Denver and Rio Grande Western were known to every railroad enthusiast in the country. All of the Geese were saved, spending decades as static ornaments in the little towns they served until, in the last ten years or so, they have been restored to running order. So now you can travel on each and every one of these unique (and smelly and noisy) vehicles, surely the only class of locomotive for which this is true. When I built my garden railway, I always wanted to have one of these. 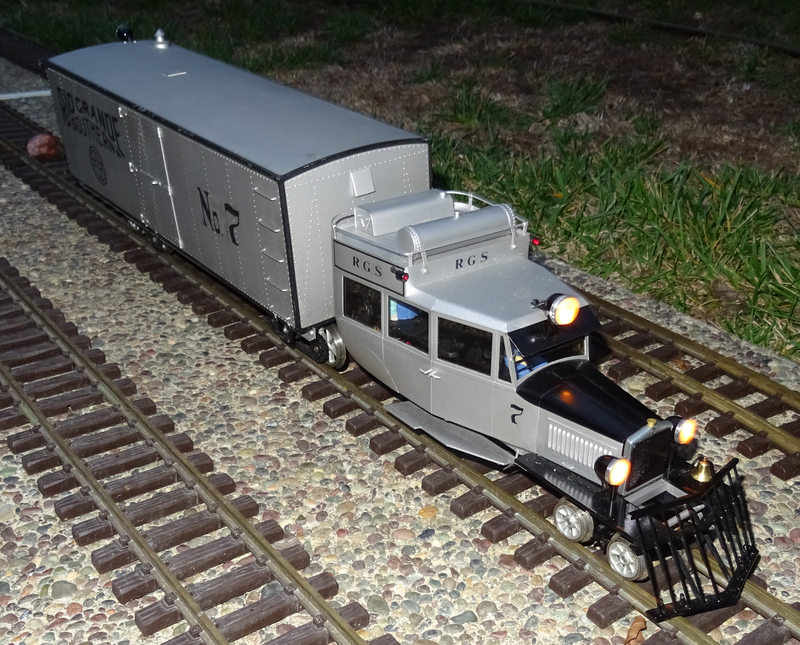 Accucraft, a boutique builder of large-scale rolling stock, made several different Geese for a while about ten years ago. They are unobtainable now, but I kept an eye on eBay and after a few weeks a model of No 7, the final Goose, showed up at home. She's in beautiful condition, hardly ever operated I'd say, and as a bonus, had been expertly fitted with a Soundtraxx sound card, compete with authentic Goose sound effects. She still had all the documentation and instructions from the conversion. I tried her out with simple DC input, and she ran perfectly. Unfortunately, though, I had to put a stop to that. My layout uses DCC, which is to say computer-based train control. Every locomotive requires a decoder, a tiny miracle of modern electronics that turns 18V AC on the track, with a superimposed control protocol, into DC to operate the motors and all the accessories. For modern locos, it's just a question of plugging in a decoder, and everything just works. Or so they say - I've never converted one of these, so I wouldn't know. For older locos, it's somewhere between tricky and a nightmare. The biggest problem is that the rails are, obviously, connected directly to the motor. You have to figure out a way to break this connection - 100% reliably. Older LGB locos are particularly difficult, since the connection is direct between the pickup system and the motor. There is no wire that can conveniently be cut. The decoders I mostly use (NCE D408SR) are fairly robust - except that even a fleeting contact between any of the motor or accessory outputs, and the track voltage, will toast them in a heartbeat. My worst experience was with my LGB track cleaner, where a failed piece of insulation toasted the decoder, all the other electronics in the loco, and in the ensuing meltdown took out some of the control circuits for the layout. In this case, though, the motor and pickup wiring was easy to separate. Then there is the big decision: to do a "full" DCC installation, with everything like lights and sound running of separate decoder accessory outputs; or a "lightweight" installation, just connecting everything to the motor output. The latter is easier but means that lights and the rest can only work when the loco is moving, which I find a lot less satisfactory. In this case it was fairly easy to rewire it for a full installation. A sound card makes it much harder. The Phoenix uses the track supply both for its own power, and as a control signal to tell it what noise to make - not only the speed of the train, but other Goose sounds like changing gear. It has a rechargeable battery, to supply power when it isn't moving, but lead-acid batteries don't like being left uncharged and I think mine has long since gone to the great battery charger in the sky. There is a separate charger circuit, though, and the obvious thing to do is connect this to the track pickup, using the motor output only for control. So that is what I did. Big mistake. When I connected everything up, the sound card operated even when it shouldn't. By the time I finally realised that I'd just arranged a sneak feed between the track and the motor output, it was too late. Toasted decoder. Removing the connections to the sound card and installing a brand new decoder confirmed this. Thank goodness for NCE's "no questions asked" $25 replacement warranty. A sound card has inputs that make it whistle, toot, clang bells and so on by command. 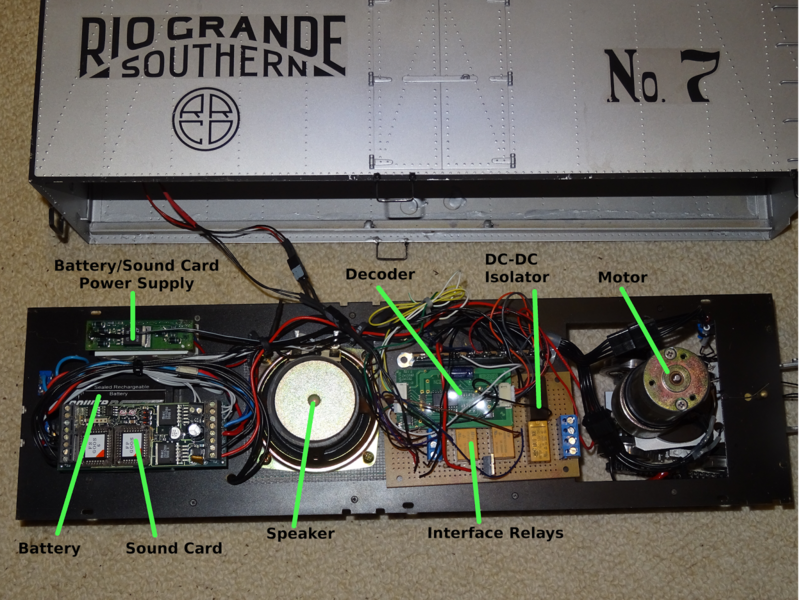 As delivered, my Goose had reed switches underneath that could be operated by fixed magnets in the track. This isn't very practical but with DCC it's obvious to run these from the decoder. Obvious, but not easy. There is no common neutral between the sound card and the decoder, so the operation has to be electrically isolated. This means using either opto-couplers or relays. As long as space is available, I prefer relays - they're not polarity sensitive, and generally more robust. I ended up building an auxiliary card on a small piece of stripboard with three relays: one each for the horn and bell, and a two-pole relay to isolate the sound card completely. Sound can be very atmospheric, but there are times when you'd just like the trains to look good, chugging along in silence. It also has the 6 volt regulators that run the lights - the decoder produces 18V, which is way too much. There remained the problem of providing independent power to the sound card. $10 on eBay or so will buy an isolated DC-DC converter, taking the decoder voltage as input and generating 12 totally isolated volts as output. End of sneak path. Finally, after several weeks of sitting on my bench, Goose #7 is ready for service, with controllable lights and thoroughly Goose-like sound effects. The picture below shows everything that hides inside the freight car. Its a good job there's plenty of room! (I wrote this over three years ago, when Cisco first started to show serious signs of losing the plot. They seemed to make a miraculous recovery, but now things look grimmer than ever, and my conclusion remains as valid now as it was then). Cisco's recent woes will be no surprise to those who know the company from the inside. The only surprise is how long it has taken. I was surprised, though, by the naivety of some of the analysts' remarks, and in particular the apparently universal view that all Cisco needs to do is get rid of a few dubious acquisitions like Flip, for everything to be restored to its rosy past. One I read said, "The fall in Cisco's gross margin from 67% to 50% is due to the lower margin on consumer products. Disposing of these is a necessary step to restoring margins." Or something like that anyway. The simplest of arithmetic shows that this cannot be true. Linksys is by far the largest part of the consumer portfolio, but it is still well under 5% of revenue. The others are just noise. Even if all these business ran at zero margin, the total effect on overall margin would be a couple of percentage points. So it can't be that. Cisco has been trapped in an awkward spot for a long time, and the consumer business is just one aspect of a well-motivated attempt to get out of it. When you have a near-100% market share, there is just nowhere else to go. Well over half of large enterprises in the US still furnish their entire network infrastructure more-or-less unquestioningly from Cisco. Practically all of Cisco's actual profit comes from the switches and routers that are to be found in nearly every wiring closet and data center in the western world. Everything else is funded out of this apparently inexhaustible gravy train. Growing this to a $40B business has been an amazing achievement, but it's not easy to find another one like it, and this is no longer a rapidly growing sector as it was a decade ago. Hence the moves to the consumer, the data center and others. But nothing lasts for ever. The core functions of enterprise networks, exemplified more than anything by the Catalyst 6500 family, are already a commodity. For well under $500, Broadcom or Marvell will sell you a chip that does everything you actually need from the Cisco product. They'll even give you complete designs, ready to be sent to a board shop. The days are long gone when Cisco's added value lay in the extraordinary breadth of IOS's support for obscure proprietary protocols. Networks now are all-IP - as indeed John Chambers has been saying. It's only inertia, combined with quite a lot of Fear, Uncertainty and Doubt, that makes people stick with Cisco's high-margin products. And just to twist the knife, the maturity of WiFi means that the enterprise is - finally - moving away from the all-wired model that puts multiple ethernet jacks in every office and cube. That alone has the potential to demolish Cisco's profitability. Worse, competition from HP, Huawei, and white-box vendors - none of whom have Cisco's cost structure or grossly inflated overheads - is driving down the margin. Let me expand a little on the "grossly inflated overheads". Cisco's development organization functions like 18th century Europe or India - lots of principalities with headstrong leadership, who (mostly) do not compete with each other for territory, but have no intention of sharing anything either. That's why every Cisco product family has its own system architecture, its own ASIC development, and - increasingly - its own software. (Time was when everything ran IOS, which was reasonably common across all platforms, but now IOS has no future relevance for most of them. Only the name, IOS-something-or-other, remains common to what are in fact totally different software systems). The good thing about this strategy is that it avoids the "one egg, one basket" problem that for example brought down DEC in the 90s. The bad thing is that it is hugely expensive, and tends to get worse and worse - it's rare that divergence returns naturally to convergent paths. This has been a deliberate strategy on Chambers' part. The last time Cisco had any real cohesive technical strategy was under Ed Kozel, in the late 90s. Since then the CTO has been paid to not interfere in the operation of the individual principalities. Charlie Giancarlo seemed to be looking for some kind of unification during his brief reign, and for his pains - ahem - decided to seek new opportunities. Since then there hasn't even been the pretence of any overall leadership of product development, just a "council" whose role is to rubber-stamp whatever each group was doing anyway. So what can Cisco do? The core business is moving to a commodity, and shrinking anyway. Numerous attempts to move out of this area have met, at best, moderate success (by Cisco standards that is - even the failures make more revenue than many mid-sized companies, but they aren't profitable). What does Cisco really have? The answer, of course, is a vast and mostly loyal customer base. Cisco as a vendor and integrator still has huge strengths - in particular, its (entirely justified) reputation for digging customers out of the dirt no matter how they got there. It's still true, in the enterprise at least - as it once was for IBM - that "nobody gets fired for buying from Cisco". So Cisco needs to make the same transformation that IBM did 20 years ago under Lou Gerstner, from being primarily a product company to being primarily a service company. And, in the process, to realise that practically all of its product development is context, not core. That will be very tough to accept - it means questioning everything, even the core switch business, not just closing down Flip. It will take a while to happen, and the risk in getting from here to there is huge. This week has seen the close of the final chapter of my involvement with Cisco. That may sound strange, considering that I left the company eight years ago. But on Monday, they suddenly closed down the team in the UK that I built 15 years ago. They were probably the best software team in the whole company - and if that sounds like an overblown claim, I'll justify it later. So it's ironic that this happens as Cisco says they need to invest massively in software and hire thousands of people. But these things happen in large companies. I joined Cisco in 1999, to run their almost-new UK development team. It was about 25 people then, and within a year we'd increased it to nearly 100. Hiring in Silicon Valley was crazy and the company was desperate to get engineers on board. An anomaly in the way the European and US HR systems worked together (or didn't) meant I hired all those people with (as I recall) just three requisitions. My own recruitment process had been strange. The guy who started the UK team had decided to retire, and was looking for a replacement. He got my name from a couple of former colleagues. The discussion went something like, "I need someone to take over the team, and X and Y said you're the right person for the job. When can you start?" It wasn't quite that simple, though, because a bunch of people at HQ in San Jose had to approve me as well. So I flew over and met them, and they all said "[UK manager] says we should hire you, what will it take to get you on board?" Well, one person out of the half a dozen did actually ask me a few interview-style questions. And I met the VP of the group - my boss's boss - but he'd been fired by the time I started, a few weeks later. As I discovered later, that was an indication of the way things work at Cisco. I knew about half of my new team already. The network software development community in the UK is small, and several of us worked together at DEC's network team, that had dissipated a few years earlier. Hiring consisted of sitting down with the team every couple of weeks and running through the list of people from our past lives who we should call. Given the prestige associated with Cisco back then, most of the ones we wanted ended up joining us. Actually I think they all did. Half the team was just outside London, about a mile north of Heathrow. From my office window I could see, and even hear, Concorde taking off every morning at 11. The other half was in Edinburgh, where they had an office as unlike the boring Cisco norm as could be - a converted whisky warehouse down by the former docks in Leith. Directly opposite was the imposing modern montrosity of the Scottish Office. Around the corner was the Malmaison Hotel, where I stayed every time I visited. The converted seaman's hostel housed not only a very classy and comfortable hotel (just writing about it brings to mind its comfortingly luxurious rooms with their huge, soft white-sheeted beds), but also an excellent restaurant. Leith wasn't always a classy place - 50 years ago you definitely would not go there at night. Even now it hovers between being an 'in' place and hideous 1960s tower blocks. But if you need to forget, the Malt Whisky Society is a short walk from the office - and we had a corporate membership. You could sip cask-strength (50%) spirit at very reasonable prices. I do mean sip, at this strength it's almost undrinkable, and the next day's hangover can be a problem too. For the first couple of years, Cisco was rich. Who could forget the weekend in Zermatt, staying at a Leading Hotel of the World, spouses invited too, the agenda carefully planned so that most of the day could be spent on the slopes. (And during the rare moments of work, my introduction to MPLS Multicast, a topic of immensely arcane complexity). For two years we held our office Christmas party at Gleneagles, a spectacular 1930s Scottish hotel famed for its golf course and its gothic opulence. I said earlier that this was the best software team in Cisco. We'd carefully selected its members from the finest of all the people we'd worked with before. I was the 29th person there, and within a year we'd grown it to 80 people. Not everyone in a team that size can truly be an A+ player, whatever Google would have you believe. But we had way more than our fair share. In San Jose, Cisco was suffering terrible attrition. The week I joined, my boss was too busy to speak to me because two leading lights - famous names in the industry - had quit on the same day, to go to classic startups and make their fortune. But in the UK, Cisco was the best show in town. During the 15 years of the group's life, not a single one of the A+ players left - for the simple reason that there was nowhere else for them to go. Starting a remote group is hard. Its founder, my predecessor, had scraped together whatever unloved, unwanted project remnants he could get. Yet within a couple of years we had flagship projects, like Cisco's IPv6 implementation and the high-speed packet forwarding path, CEF, simply because all the people in San Jose who knew these topics had left for greener pastures. It wasn't all roses, though. Cisco IOS (never iOS!) was the heart of all its most successful and profitable products, and the maintenance burden was massive. At one point we calculated that we were maintaining about 750 distinct versions of the code. At the same time there were two huge (and as it turned out misguided and ultimately unsuccessful) infrastructure projects going on, which each required major disruptive change throughout the entire code base. At my very last all-hands meeting before I left Cisco, one developer summarised it neatly in a so-called question: "We spend nearly all our time fixing bugs and committing them into dozens of subtly different branches, and the rare actual development we do is forced upon us by projects that are nothing to do with us. We never get to do anything for the benefit of the stuff we actually own. Isn't something seriously wrong?" Well, I was their VP, I could hardly agree with them. Not openly anyway, though it was exactly what I thought too. But I'm getting ahead of myself. About 18 months after I joined, there was a huge shakeup in senior management in San Jose (not an uncommon event). I was asked to move to the US and take on leaderhip of the whole of IOS (well, the most interesting parts anyway). It was the job of my dreams. It would have been impossible to refuse, even though it meant giving up our much-loved house in France, a house we'd never expected to move away from. (During all the time I was working for Cisco in the UK I was commuting every Monday and Friday from the south of France, staying in my flat in London during the week. Sometimes tough, but not without its advantages). Our traumatic move from Valbonne to California took place in June 2001. For four years I did what I'd been told was wanted, injecting leadership into the group, encouraging good ideas, defending my team (nearly 500 people) from the bureaucratic madness of a giant company, trying to juggle the conflicting demands of a dozen hardware fiefdoms. We made some pretty cool stuff happen. Then it slowly dawned on me that actually this was the last thing anyone wanted me to do. What they really wanted the IOS team to do was fix bugs and keep its mouth shut. There were some serious egos in Cisco (still are, though mostly not the same ones) and they were the ones in charge. It didn't help that we'd had our own management turmoil. The protective, supportive and incredibly smart manager who'd brought me to the US had been replaced by a complete idiot whose preoccupation (and sole talent) was brown-nosing all he could, keeping his job, and surrounding himself with equally clueless yes-men who owed everything to him. The only good thing he ever did for Cisco - but it was really good - was to take a senior position at one of their major competitors, where he single-handedly demolished their entire core software base. It was very far from an enjoyable time. My last year at Cisco was the most miserable of my professional life. Finally I took a job at a startup, and started to enjoy going to work again. At Cisco, I felt that the 20% of my job that was enjoyable made up for the 80% that wasn't, an endless succession of political meetings where nothing was ever decided. In the startup world, I enjoy my job 99% of the time. When I moved to the US, the UK team remained part of my bigger group. I visited them three or four times a year. I also started a development team in Tokyo, but that's definitely another story. It's now been longer since I left Cisco, than the time I spent working there. The bitterness I felt when I left has long faded. At DEC I had the good fortune to work, briefly, for one of the giants of the computer industry, Alan Kotok. He explained very well: "Everything that's not at corporate HQ is attached by a giant rubber band, held in place by a fragile little pin. At the slightest disturbance the pin will shake loose and the band will twang back to HQ." And that, sadly, is what happened to my UK team that had been so carefully built and nurtured. It was a huge shock to learn that they were being jettisoned, even though they could have been of such huge value to the company as it seeks its troubled and uncertain pathway in the future of networking. One summer when I lived in France, I started building a simple garden railway. It was just a large oval of LGB track with some loop sidings, and a couple of trains. With my son, we automated it using the LGB train detectors and some creative wiring. It was fun to build, and watch the trains going round while drinking the first Pernod on the terrace. But soon after that it got packed up with everything else when we moved to California. Soon after we moved to our present house, I noticed that one of our neighbours had some LGB track in their garden. Talking with him inspired me to build a very small layout in the enclosed atrium of our Eichler, which is about 15 feet square. This time I automated it using a computer, with the JMRI control system. I had three trains that took turns to go round, but in the tiny space (for LGB) it wasn't all that interesting, and it was in the way too. It didn't last long. Our garden is big enough for a decent sized railway, but I could never figure out how to make it compatible with having an actual garden. Then my daughter decided to visit, with her son. At three years old, he's completely obsessed with Thomas the Tank Engine and anything and everything to do with trains - for a while his favourite video was a documentary about the construction of the French TGV network, though he surely understood none of it. He won't actually be here until nearly a year from now, but it was a good excuse to get started. We suddenly realised that if we used the concrete pool surround, I could create a permanent layout. As a bonus, it is relatively flat which would make it much easier to keep the trains on the rails. I took stock of the LGB track sections which had been gathering dust in the garage for over a decade. I had enough to build along two sides of the pool - a total of about 60 feet - with a reversing loop at each end, making a kind of dogbone suitable for continuous running. On one side of the pool there's enough space to put several parallel sidings, so different trains can be run at the same time. I also bought a Bachmann Thomas set, with Thomas and his two coaches, Annie and Clarabel, while on eBay I found the coal truck labelled "S. C. Ruffey" (geddit? - he was quite a card, that Reverend Awdry). The first attempt had one of the loops on a corner of the lawn. I quickly realised this was a bad idea. The LGB trains could just about cope, but Thomas his coaches certainly couldn't. A quick extension along the third side of the pool gave access to a big concrete area, solving that problem. When I was a lad and used to drool over Hornby-Dublo layouts in the Meccano Magazine, they always had reverse loops in them. There was a reason for that: because they could. On a three-rail system, like Hornby-Dublo or Marklin, there is no electrical problem. But in a two-rail system, like LGB, the two rails are the positive and negative sides of the power supply to the trains. A quick sketch will show that a reverse loop inevitably connects them together, creating a short circuit. Many and varied are the ingenious solutions to this problem. After several false starts, I eventually built a little control box for each end of the layout, using the LGB train detectors to operate some relays that switch things around as required. In the process, I discovered some limitations of the LGB system. The trains are superb, and the track is indestructible. But the control system for points has some odd idiosyncrasies. The detectors can in theory operate the points directly, but they contain wimpy little magnetic reed switches, rated at just half an amp. It doesn't take much to toast them. They get red hot, which fuses the contacts together - guaranteeing instant destruction. Luckily it isn't hard to replace the failed switches (just as well, because like all LGB parts, they're eye-wateringly expensive). The real answer is to use them to drive only very light loads, like relays or computer inputs. Another problem is the electrical switches that you can arrange to be changed as the points move. I was relying on these to change the polarity of my reverse loops - until I found that often one would switch and not the other, creating a short circuit across the power supply. More relays were the answer, and the LGB switches are back in the parts box. The electrical control of the trains themselves uses the DCC system. In the old days, the rails carried the actual electric voltage for the motor in the locomotive. This was very restrictive, and made it very complex to be able to run more than one train at a time, or even have more than one train on the track. DCC avoids this by providing a permanent voltage, overlaid with a control signal that tells each train individually what to do. As a bonus, it's easy to interface to a computer. The ultimate goal of all this is to make it run completely automatically. In parallel with building the railway itself, I've been experimenting with using an Arduino to run the control system. It's coming along nicely, more on that soon I hope. Today was the first day that I've run the full layout, with several trains. I have a Bachmann Shay which I added sound to and converted to DCC back in France - very painfully. It pulls a train of eight or so log and other freight wagons. There are a couple of LGB European locomotives, and of course Thomas with Annie, Clarabel and Mr Scruffey. Control for the moment is still manual, using a virtual control panel built with JMRI. There are still hours of endless fun to be had - and quite a few minutes of frustration, no doubt. I should have realized how fascinated my Dad was with trains at an early age, but somehow I didn't. When I was tiny - just four years old - he would ask kindly engine drivers at Liverpool Street station to show me round the cabs of their giant steam engines - Britannia and others - that pulled the express trains that would roar through our local station. The vast expanse - as it seemed to a small boy - and the roaring heat of the firebox are impressions I've never forgotten. Or he'd take me to a nearby bridge to watch the trains go by. He bought me my first trainset when I was five. It was clockwork, with an oval of O-gauge track and two tinplate carriages. It just went round and round but I loved it. I moved up to an electric train - Triang OO gauge - on my seventh birthday. It was a success, because I have loved everything to do with trains ever since. But I never realized how deep his own interest was until much later. After he retired my Dad would often call phone-in radio programmes, and it was to one of those that he told his own childhood railway story. Money was scarce back then, and toy trains were expensive even for the people who had money. He would have loved one but it was unimaginable. But one Christmas he got as a present a toy railway signal. Just the signal, nothing else - no track, no trains, just the signal. Signals then were more than just lights. 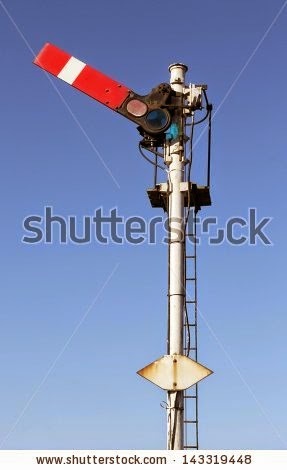 They had a long red arm which moved up and down, its position telling the train driver whether he could proceed or not. Down and horizontal, it meant stop. Up at an angle, meant go. At night, red and green lights shone through colored glass. It was operated by a signalman, in a signal box possibly a long way off. It was his sheer muscle power, transmitted via up to a mile of thick steel cable, that made it move. For my Dad, the rest of the railway lay just in his imagination. A train was coming, the signal must be pulled to show clear. The train rushes by in a cloud of steam and smoke, the noise deafening, loaded goods wagons banging and bouncing over the joints in the track. Then it has gone leaving only a cloud of dust. The signal must be set to danger behind the train. But wait, there's another one coming, a passenger train, the express. 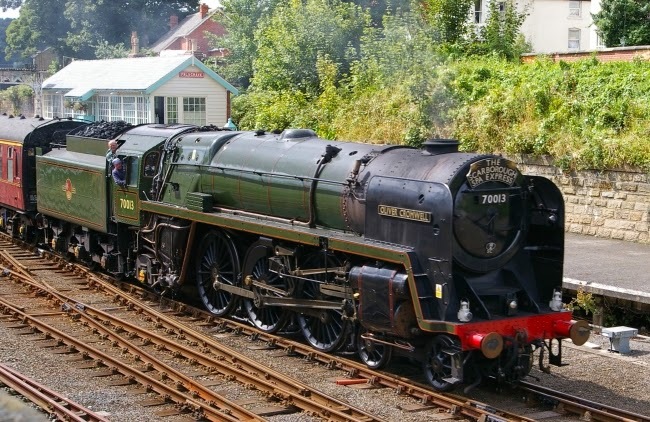 The gleaming engine rushes past, passenger's faces peer out of the varnished carriages. Again the signal must be pulled off, the signalman putting all his weight behind the lever as the heavy arm rises. But all this was only in his imagination. In reality there was just a small boy and a toy signal, as he moved the arm up and down. After he had told his story on the radio, other people called in to say he'd reduced them to tears. 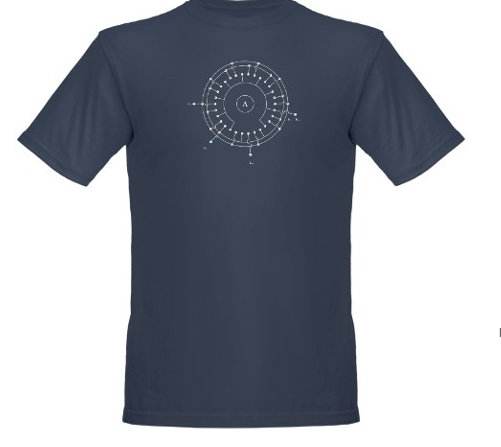 It all started when my friend George gave me a tee-shirt for my birthday, with the internal circuit of a Dekatron counter tube on it. The Dekatron was a 1950s piece of electronic wizardry, capable of counting to 10 with almost no external circuitry, as opposed to the numerous tubes that would be required otherwise. This reawakened my interest in retro-electronics, never far from the surface. A few years back I built several tube (valve) amplifiers, which I still use for daily listening, and I still have a well-equipped workshop for this kind of stuff. I'll gloss over the Dekatron, since hopefully I'll have something to write about that quite soon. But then one thing led to another and I started looking at things I could do with Nixie tubes. These are about the coolest thing in retro-electronics. They look like normal tubes but inside they have ten electrodes and can display any digit from 0 to 9 in an orange neon glow. When they first appeared, in the late 1950s, they were way too expensive for consumer equipment. They were used in laboratory equipment and the like. My school, in around 1967, had a Sumlock Anita calculator, the first electronic calculator, which used ten Nixie tubes to display its result (and some very clever tube-era electronics to do the calculations). Now of course LCD displays are cheaper, smaller, and generally more convenient. There's no commercial interest in Nixie tubes. But they are really cool, and there are still lots of them about. The Russian electronics industry carried on making them for a lot longer, maybe even still is. They're available for $5-10 each for the common types. As a bonus, if you have friends who collect stamps, you get all sorts of interesting stamps with them from places like Moldavia and Ukraine. Retro-electronics is all very well, but to do anything with these tubes you have to give them something useful to display, like the time. And that's where a partnership with modern electronics comes in handy. For one thing they run on around 150 volts. With 1960s technology, that would mean a big, heavy transformer and associated parts. Today, it can be generated with a few tiny components that fit into a square inch or so on a corner of a circuit board using a boost-mode switched power supply circuit. Powerful microprocessors are now available for a dollar or so, so it's easy to generate something interesting to display. There are several kits on the market for digital clocks using Nixie tubes. I chose one from PV Engineering in England - it had the best looks in my opinion, and it didn't hurt that it is quite a bit cheaper than any others. It took a few days to arrive, and when I opened the package there were six never-used Nixie tubes, an empty circuit board, and a bag of components. In anticipation of its arrival, I'd already cleared off my workbench - a project that had been waiting for at least a year. So the only thing left was to launch into its construction. I started on Sunday morning, and by an admittedly very late dinner time it was working and housed in the very nice clear plastic box designed for it. I suppose the total actual assembly time was about 4-5 hours. By far the most painful part was wiring the tubes themselves. Unlike most vacuum tubes they have wire ends which have to be individually soldered into place, and there are eleven of them (necessarily) on each. Actually there are 13, because two aren't used and have to be cut off. This is a bit nerve-wracking the first time, it would be so easy to cut off the wrong wires and be left with useless tubes. The total number of solder joints to be made is probably about 500, of which roughly half are for the tubes themselves and their associated wiring. But the instructions are excellent and make it easy to do everything step by step and even test things along the way. A Nixie-tube clock all by itself would be neat, but since it's controlled by a computer (one of the omnipresent PIC range - there are probably a couple of dozen in every car) it can do a lot more. At 50 seconds past every minute the digits all flash and spin, and it shows the date for a few seconds. There's an alarm clock. Underneath each tube is a three-color LED, with a nifty light tube made of shrink-wrap that shines up into the glass base of the tube. The color can not only be set, it can be set differently for each hour of the day and can be made to change slowly or quickly through the whole spectrum. It comes with a tiny GPS receiver which can be stuck onto a window and which ensures that it always shows the right time and date, even after a lengthy power outage. I wish all the other myriad household devices that include superfluous clocks were half as smart. For now it's still sitting on my bench while I decide where I want it. It indeed looks very cool. Career software and systems engineer, 1500 hour private pilot including helicopter and aerobatics in the Pitts, linguist, generally curious about almost everything.